Gov. Jerry Brown signed a pair of bills September, 2014 that went into effect January 1, 2015 that protect residents in homeowners associations across San Diego County and California who want to replace their water guzzling lawns with drought tolerant plants, or just cut back on turf watering during a drought. Brown signed Senate Bill 992, which prevents HOAs from imposing fines on residents who reduce or stop watering landscaping after the governor has declared a statewide emergency due to drought, as Gov. Brown did in January. The protections do not apply in HOA neighborhoods that use recycled water, according to the bill by Sen. Jim Nielsen, R-Gerber. 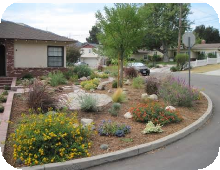 This entry was posted in Uncategorized and tagged drought resistant landscaping, fines, hoa, rules. Bookmark the permalink.